AMSOIL Semi-Fluid Synthetic EP Grease is formulated with high-viscosity ISO 460 synthetic base oils and a sophisticated additive package, providing an effective protection system that helps reduce wear and prevent damage. Its advanced extreme-pressure additives provide superior protection and performance in shock-loading applications that can rupture the oil film of conventional greases and lead to damaging metal-to-metal contact. 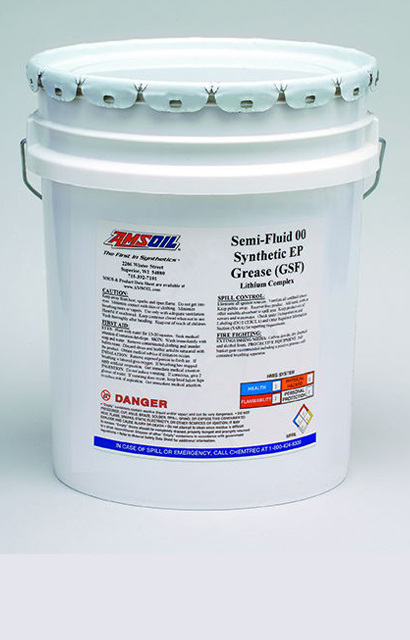 AMSOIL Semi-Fluid Synthetic EP Grease resists water and provides superior protection against corrosion and oxidation, which can eat away and destroy critical components and lead to equipment failure. AMSOIL Semi-Fluid Synthetic EP Grease is available in 35-lb. pails and 120-lb. kegs and 400-lb. drums are available by special order.